Wanda Grace Good, 92, of Traverse City, passed away peacefully Sunday, January 28, 2018 at Munson Medical Center surrounded by her loving family. Wanda was born November 3, 1925, to the late Charles and Fern (Albert) Farver in Indiana. At the young age of 16 she met her husband and best friend, John. They married August 7, 1942 before John left to serve in the Army during WWII. They spent over 75 years of being deeply devoted to each other. Her second career after raising their five children began in 1972 as a highly skilled Operating Room Technician of 28 years working in various hospitals in Michigan and Pennsylvania. She loved working in surgery and had skills that amazed the doctors she worked with. One surgeon in particular always made sure that Wanda was in his operating room and still kept in touch throughout the years. 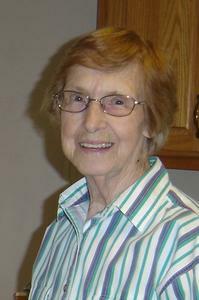 She was an avid gardener with beautiful flower gardens and always sharing plants with family, friends and neighbors. Quilting was her most enjoyed hobby even at the age of 92 and loved gathering with the ladies at the Quilting Club at Grawn United Methodist Church. She left behind many beautiful quilts for family and friends. Donating many quilts to those in need; The Father Fred Foundation, Women’s Resource Center, Cherryland Humane Society, Suttons Bay Animal Hospital, and Adopt a Grandparent, just to name a few. She was a devoted wife, mother, grandmother, and caregiver…always putting others before herself. Showing unconditional love to her grandchildren allowing them to get right in the middle of whatever grandpa and her were doing----cooking, gardening, riding the tractor, sewing and games. Our family is beyond blessed that God chose her to be our loving wife, mother, and grandmother. It’s now time for her to return to our creator and be reunited with her late loved ones, especially her parents; sister, Kathleen; daughter, Jeanee, and two grandsons, Eric and Michael. She is survived by her husband, John Good. She is also survived by four of her children, Linda (Mike) Keeton of Hershey, PA, John (Beth) Good, Jr. of Rock, MI, Sandy Good of Traverse City, MI, Mark (Catherine) Good of Belding, MI, 13 grandchildren, and 19 great grandchildren. Wanda’s family wishes to express heartfelt gratitude to the Munson Medical Center staff on B4, including Dr. Hal R. Yost, for their compassion and care that brought comfort and peace during her last days. To honor her wishes, a private family celebration will be held this summer with extended family. Memorial Contributions may be made to the Grand Traverse Audubon Club, c/o Ed Kaminski, Treasurer, 1498 Driftwood Dr., Traverse City, Michigan 49686. Please share your thoughts and memories of Wanda with her family by way of her online guestbook at www.lifestorytc.com.